CKNW. Bring all your friends to the queer comedy romp of the season!" Although the evening was a scorcher and the downtown filling up with partiers heading to the fireworks display as well as numerous Vancouver Pride events, Glen and I braved the trip via Skytrain to the Vogue Theatre to enjoy a night of laughter presented by Vancouver Pride Society and TD Bank Group. I have to admit, my number one draw was my good friend - the lovely Symone Says. I never turn down a chance to see her on stage. The fact this evening was also in support of A Loving Spoonful and Friends for Life sealed the deal. Loved the title - Laugh Out! - as it was a perfect description of what we did this evening, sometimes loudly while holding our sides or clapping. Point Black Entertainment Executive Producer Howard Blank opened the evening by welcoming us and introducing the night's MC - Drex from “Drex Live” CKNW Radio. Drex managed to put smiles on our faces from moment he walked on stage and took the mic. Favourite moment - when he found someone in the audience with Grindr on their phone and brought them on stage to see if anyone else in his "tribe" was trying to make contact. The answer was yes and they were in the audience, but no one would admit it was them. Vancouver's First Lady of Glam - Symone Says - was given the task of warming up the crowd. From a game of Tops and Bottoms where hilariously EVERYONE was eliminated, to a game of Symone Says, we were drawn in. The prize? A super tall Marge Simpson style wig in bright red. Next comedian Darcy Michael took the mic. Mitchell's style of comedy quickly hit the mark. Several of his funniest were focused on his spouse - he's been married to his husband for ten years and has a teenage daughter. I can only assume his partner has a great sense of humor as he was in the audience that night. My personal fav involved his more conservative spouse's accidental run in with a very special brownie at a party, a $78 trip to a 7-11 for munchies followed by unexpected police road block on the way home. 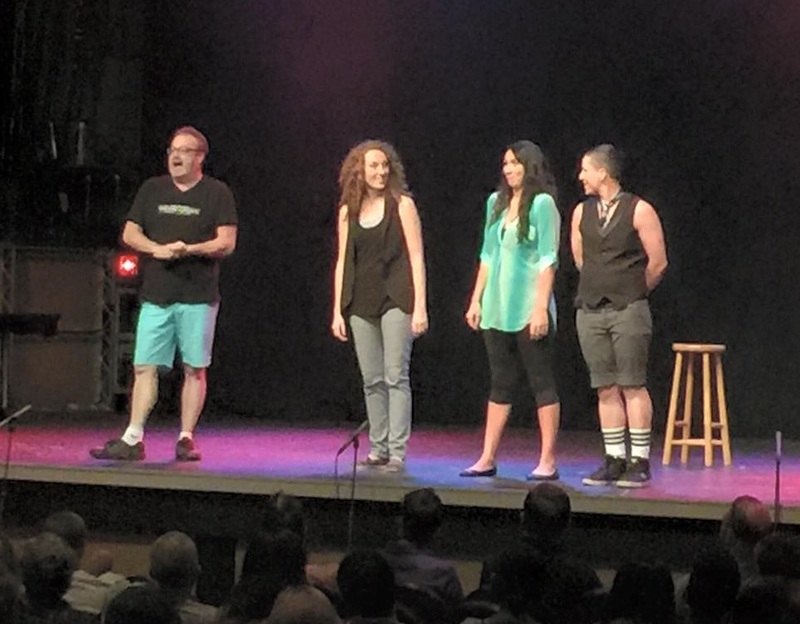 Then four performers from Vancouver’s Queer Prov came out. 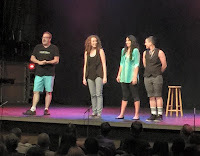 I'm a huge fan of improv and have been attending the Vancouver TheatreSports shows on Granville Island for many, many years. I also have one son who is a member of another troupe - Tickle Me Pickle. If you've never seen improv, what makes it special is they ask the audience for suggestions that are incorporated into the skits. These talented artists pulled out all the stops. I think my favourite skit involved two audience members standing behind two improvers and being their hands to accent the script. Hilarious. After a short break, the headline act - comedian Elvira Kurt - took the stage. She is very talented, high energy, funny as hell, in-your-face and unafraid to say what's on her mind. It was comedy with a message often mixed in - WAKE UP GUYS! I had to laugh as her opening skewered the black stage, black curtain and black table with black table cloth. This was Pride - c'mon! BUT if she had really looked at the audience she would have seen a mostly jeans/grey/khaki/black crowd. I was one of about three people who wore bright colours that night in honour of Pride Week and I stood out like a peacock. From there she explored tolerance, self image, border guards, parenting, relationships, what size pants she wears, nature versus nurture and more. Nothing was off the table. There was so much power in her voice and energy in per performance - her stage presence was truly larger than life. She never stopped moving, even laying down on the stage several times. I love interviewing - especially when it's with someone who can push me to new ways of looking at the world. Kurt definitely fits the bill and I would love to spend some one-on-one time with her, digital recorder running. Great performances across the board. I'm really glad Glen and I made it a priority.